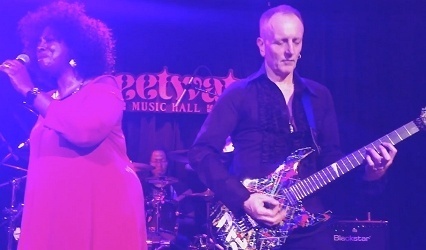 Def Leppard guitarist Phil Collen and Delta Deep played a show in Mill Valley, CA on 10th January and fan videos are available. The show took place at Sweetwater Music Hall. The current setlist includes the entire debut album plus 'Black Dog' (Led Zeppelin) and recent single 'Take Me Home For Christmas'. Phil along with Debbi Blackwell-Cook, Robert Deleo and Forrest Robinson continue their Sugar Shack tour tonight in Santa Cruz, CA. View the first Fan Videos posted so far via this playlist on YouTube. A few fan photos were also posted online - view them below.